Outside of the house there is a swimming pool, a surrounding terrace, garden, BBQ and exterior shower. Inside the house you have 1 twin bedroom with bathroom, 1 double bedroom, 1 double bedroom with bathroom, 1 bathroom, kitchen, living and dining room. 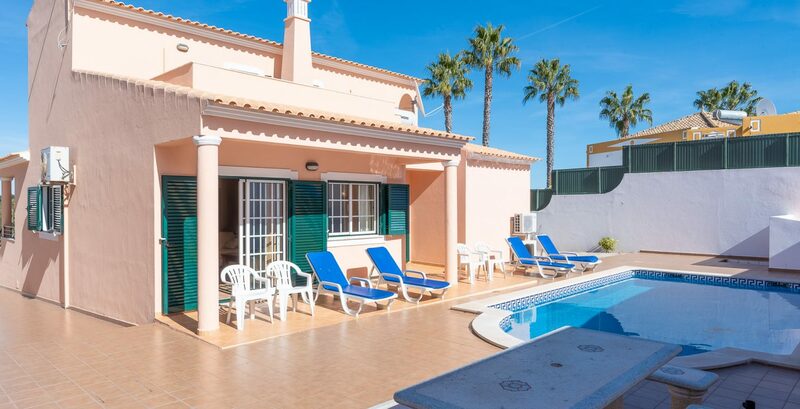 This house is located in the Vale de Santa Maria area, with a pleasant location, a few minutes away from Albufeira old town (2,5km). The house is close to the restaurants and to the shopping facilities (1,8km). Outside of the house there is a swimming pool, a surrounding terrace, garden and BBQ. Inside the house you have 1 double bedroom, 1 bathroom, kitchen, living and dining room. On the 1st floor there is 1 twin bedroom ensuite. 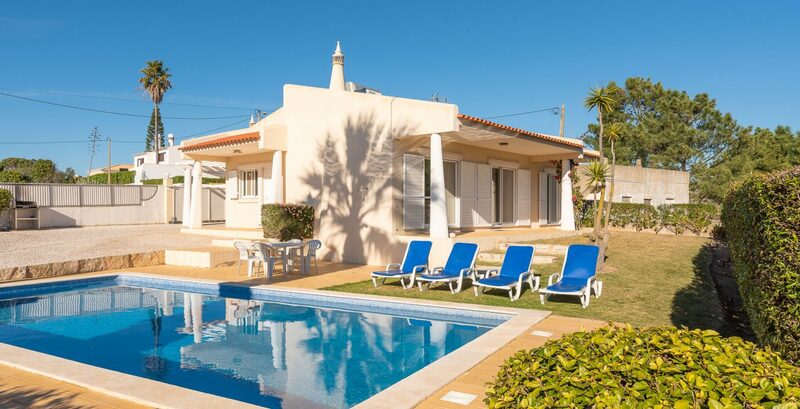 This house is located in the Sesmarias area, with a pleasant location, a few minutes away from Castelo beach (2 km). The house it’s 5 minutes from the centre of Albufeira by car (4 km). The restaurants and mini-markets are only 500m away. Outside of the house there is a swimming pool, a surrounding terrace, BBQ and exterior shower. Inside the house you have storage room, kitchen, living and dining room with fireplace. On the 1st floor there are 2 double bedrooms ensuite and 1 twin bedroom ensuite. 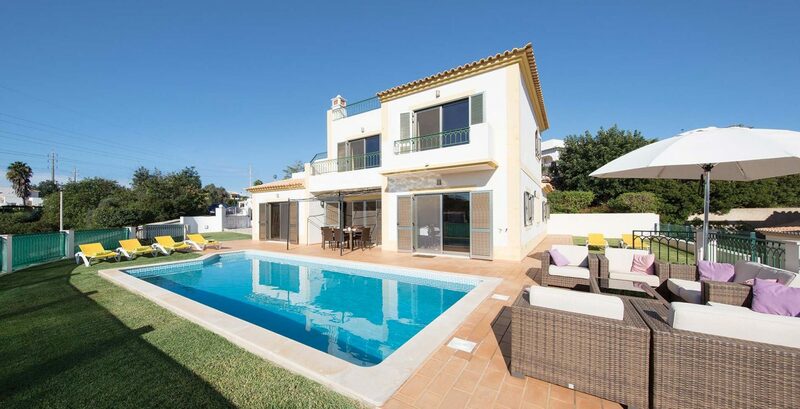 This house is located in the Castelo area, with a pleasant location, a few minutes away from Castelo beach (500m). The house is close to the restaurants and to the shopping facilities. Inside the house you have 1 pantry, 2 twin bedrooms, 2 bathroom, kitchen, living and dining room with TV and fireplace. Three-bedroom townhouse with private pool, in a subdivision in Alcantarilha, located about 3.5km from the beach of Armacao de Pera. Close to all amenities: 200 meters from an Aldi food store, and downtown Alcantarilha where you will find all the restaurants and small traders. 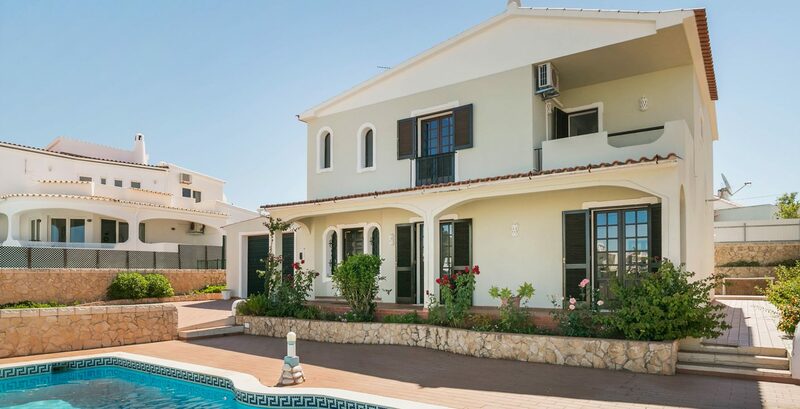 With its pleasant location, only a few minutes away by car from the beach and golf areas, it is ideal for a family retreat or relaxing holidays. This 2-storey detached villa with private garden and pool consists of the ground floor which has a toilet, hall, lounge, kitchen, and pantry. In the first floor, we have 3 bedrooms, 1 is a double with private bathroom, 2 bedrooms share a bathroom. The outside offers a surrounding terrace, garden, BBQ, pool shower and swimming pool. This house is located in the Galé area, with a pleasant location, a few minutes away from Galé beach (200m). The house is close to the restaurants and to the shopping facilities (100m). Outside of the house there is a swimming pool, a surrounding terrace, garden, BBQ and exterior shower. Inside the house you have 2 double bedrooms, 1 bathroom, kitchen, living and dining room. On the 1st floor there is 1 double bedroom ensuite and 1 twin bedroom ensuite. This house is located in the Quinta Jolu area, with a pleasant location, a few minutes away, walking, to Vila de Guia (1 km). The house is close to the restaurants and to the shopping facilities (1km). Outside of the house there is a swimming pool, a surrounding terrace, garden and BBQ. Inside the house you have 1 bathroom, kitchen, living and dining room. On the 1st floor there is 1 double bedroom, 3 twin bedrooms and 2 bathrooms.